"Laccadives" redirects here. For the subgroup, see Laccadive Islands. Lakshadweep (/ləkˈʃɑːdwiːp/; ISO: Lakṣadvīp (help·info)), formerly known as the Laccadive, Minicoy, and Aminidivi Islands (/ˌlækədaɪv ˌmɪnɪkɔɪ ... ˌæmɪnˈdiːvi/), is a group of islands in the Laccadive Sea, 200 to 440 km (120 to 270 mi) off the southwestern coast of India. The archipelago is a Union Territory and is governed by the Union Government of India. They were also known as Laccadive Islands, although geographically this is only the name of the central subgroup of the group. Lakshadweep means "one hundred thousand islands" in Sanskrit and Malayalam. 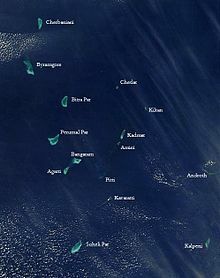 The islands form the smallest Union Territory of India and their total surface area is just 32 km2 (12 sq mi). The lagoon area covers about 4,200 km2 (1,600 sq mi), the territorial waters area 20,000 km2 (7,700 sq mi) and the exclusive economic zone area 400,000 km2 (150,000 sq mi). The region forms a single Indian district with 10 subdivisions. Kavaratti serves as the capital of the Union Territory and the region comes under the jurisdiction of Kerala High Court. The islands are the northernmost of the Lakshadweep-Maldives-Chagos group of islands, which are the tops of a vast undersea mountain range, the Chagos-Laccadive Ridge. As the islands have no aboriginal inhabitants, scholars have suggested different histories for the settlement of these islands. Archaeological evidence supports the existence of human settlement in the region around 1500 BC. The islands have long been known to sailors, as indicated by an anonymous reference from the first century AD to the region in Periplus of the Erythraean Sea. The islands were also mentioned in the Buddhist Jataka stories of the sixth century BC. Islam was established in the region when Muslim missionaries arrived around the seventh century. During the medieval period, the region was ruled by the Chola dynasty and Kingdom of Cannanore. The Catholic Portuguese arrived around 1498 but were expelled by 1545. The region was then ruled by the Muslim house of Arakkal, followed by Tipu Sultan. On his death in 1799, most of the region passed on to the British and with their departure, the Union Territory was formed in 1956. Ten of the islands are inhabited. At the 2011 Indian census, the population of the Union Territory was 64,473. The majority of the indigenous population is Muslim and most of them belong to the Shafi school of the Sunni sect. The islanders are ethnically similar to the Malayali people of the nearest Indian state of Kerala. Most of the population speaks Malayalam with Mahi (or Mahl) being the most spoken language in Minicoy island. The islands are served by an airport on Agatti Island. The main occupation of the people is fishing and coconut cultivation, with tuna being the main item of export. One of the earliest references to the region is by an anonymous author in the Periplus of the Erythraean Sea. There are references to the control of the islands by the Cheras in the Sangam Patiṟṟuppattu. Local traditions and legends attribute the first settlement on these islands to the period of Cheraman Perumal, the last Chera king of Kerala. The oldest inhabited islands in the group are Amini, Kalpeni Andrott, Kavaratti, and Agatti. Archaeological evidence suggests that Buddhism prevailed in the region during the fifth and sixth centuries AD. According to popular tradition, Islam was brought to Lakshadweep by an Arab named Ubaidulla in AD 661. His grave is located on the island of Andrott. During the 11th century, the islands came under the rule of the Late Cholas and subsequently the Kingdom of Cannanore. On 1 November 1956, during the reorganization of Indian states, the Lakshadweep islands were separated from Madras and organized into a separate union territory for administrative purposes. The new territory was called Laccadive, Minicoy, and Amindivi Islands before adopting the Lakshadweep name on 1 November 1973. The region does not have a rich flora and almost all the plants can be found on the mainland of India. There is also an absence of forest in the region. Nearly 400 species of flowering plants have been documented, including three species of sea grasses Cymodocea isoetifolia, Syringodium isoetifolium and Thalassia hemprichii, other angiosperms as Pandanus, Heliotropium foertherianum, Tournefortia argentea and Pemphis acidula as well as fungi, algae, lichens are also found. The common flora of the coral sands include coconut groves and coastal shrubs as Pemphis acidula, Cordia subcordata, Scaevola taccada, Thespesia populnea, Suriana maritima, Dodonaea viscosa, Guettarda speciosa and seaweeds such as sea lettuces, Codium and Hypena. Most people of Lakshadweep are descendants of migrants from the Malabar Coast of southwest India and the islanders are ethnically similar to coastal Kerala's Malayali people. More than 93% of the indigenous population are Muslims, and the majority of them belong to the Shafi School of the Sunni Sect. The southernmost and second largest island of Minicoy has an ethnically Mahls population that are native to the Maldives. Religious observance in Lakshadweep is characterized by certain festivals that are found in its core ethnic groups. Moulood is one such religious event when the islanders offer prayers to the divine power and eat in groups. The festival of Ratheeb is another uncommon occasion which originated in the Kavaratti region of Lakshadweep. The grave of Sheikh Kasim, one of the respected saints is praised during Ratheeb by the people of the island to gather his holy blessings. The principal languages of Lakshadweep are Malayalam, Jeseri (Dweep Bhasha) and Mahl. The people of all the northern islands speak a dialect of Malayalam with the influence of Tamil and Arabic similar to Arwi. The people of Minicoy, the southernmost atoll, speak Mahl, a variant of Divehi language spoken in the Maldives. Lakshadweep comprises the only coral atolls of the country. With a vast lagoon of 4,200 km2 (1,600 sq mi), it has territorial waters of 20,000 km2 (7,700 sq mi), Exclusive Economic Zone (EEZ) of 4 lakh (400,000 km2 [150,000 sq mi]) and coastal line of about 132 kilometres (82 mi). There is an estimation of about one lakh tonnes (100,000 tonnes [110,000 tons]) of tuna and tuna-like fishes and about an equal quantity of shark in the sea around Lakshadweep. Fishing is the main livelihood of the islanders, or else it is coconut fibre. Freshly caught tuna is processed by drying it in the sun after cooking and smoking. The resultant product, known as 'mas', are popular products exported from these islands to southeast Asian countries. Eleven workshops in islands and two boat building yards cater to the needs of fishermen. There are 375 boats in operation in Lakshadweep. 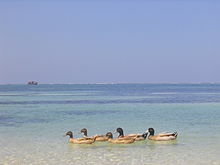 Due to its isolation and scenic appeal, Lakshadweep was already known as a tourist attraction for Indians since 1974. This brings in significant revenue, which is likely to increase. Since such a small region cannot support industries, the government is actively promoting tourism as a means of income in Bangaram and Kadmat islands. Bangaram is projected to become a major destination for international tourism. Marine fauna are plentiful. Water sports activities such as scuba diving, wind surfing, snorkelling, surfing, kayaking, canoeing, water skiing, sportfishing, yachting and night sea voyages are popular activities among tourists. Tourists flock to these islands throughout the year, except during the southwest monsoon months when seas are extremely rough. The government has also proposed to set up two customs clearance check-in offices so that tourists can enter directly instead of getting permission from the nearest customs office in Kochi, which is 260 nautical miles (300 mi; 480 km) from these islands. These will be the smallest customs offices in India. Tourism is expected to get a big boost after these offices open as the islands lie on one of the busiest cruise ways. Agatti Aerodrome on Agatti Island is the only airport in Lakshadweep. Alliance Air, a subsidiary of the state-owned carrier, serves Agatti and flies to Kochi and Bengaluru on the mainland. Kingfisher Airlines, had flights connecting Kochi and Bangalore to Agatti before the airline ceased operations. The other islands are linked by the Pawan Hans helicopter or boat service. Six ships connect Kochi, Calicut(Beypore) and Lakshadweep: MV Kavaratti, MV Amindivi, MV Minicoy, MV Arabian Sea, MV Lakshadweep Sea and MV Bharath Seema. ^ "The Laccadive, Minicoy and Aminidivi Islands (Alteration Of Name Act), 1973". The Indian Lawyer. 26 August 1973. Retrieved 9 May 2012. ^ "Lakshadweep". encyclopedia.com. Archived from the original on 27 January 2010. Retrieved 1 August 2012. ^ Ashalatha, B.; Subrahmanyam, C.; Singh, R.N. (1991-07-31). "Origin and compensation of Chagos-Laccadive ridge, Indian ocean, from admittance analysis of gravity and bathymetry data". Earth and Planetary Science Letters. 105 (1–3): 47–54. Bibcode:1991E&PSL.105...47A. doi:10.1016/0012-821X(91)90119-3. Retrieved 2015-02-25. ^ a b c "Marine investigations in the Lakshadweep Islands, India". thefreelibrary.com. Retrieved 1 August 2012. ^ “Lakshadweep & It's People 1992-1993” Planning Department, Govt. Secretariat, Lakshadweep Administration, Kavaratti. Page: 12. ^ "History". lakshadweep.nic.in. Retrieved 1 August 2012. ^ "Lakshadweep". Encyclopædia Britannica, Inc. Retrieved 2 August 2012. ^ Forbes, Andrew D.W. (1979). "South Asia : Journal of South Asian Studies : Volume 2 : Sources towards a history of the Laccadive Islands". South Asia: Journal of South Asian Studies. 2: 130–150. doi:10.1080/00856407908722989. ^ Logan, William (1887). Malabar Manual. New Delhi: Asian Education Services. p. 2. ISBN 978-81-206-0446-9. ^ "Lakshadweep". World Statesmen. Retrieved 8 October 2016. ^ a b "Location, Area and Population". lakshadweep.nic.in. Retrieved 1 August 2012. ^ 'INDIA: A Physical Geography' ( ISBN 81-230-0656-X), 1968, Publications Dn, Ministry of I&B, Govt. of India. page:74. ^ a b "Biodiversity and Environment Protection" (PDF). Lakshadweep Development Report. Planning Commission of India. Retrieved 3 August 2012. ^ Khan, Asif N (2017). "FIRST RECORD OF ORIENTAL PRATINCOLE GLAREOLA MALDIVARUM FROM LAKSHADWEEP ARCHIPELAGO". Journal of the Bombay Natural History Society. 114. ^ "Lakshadweep Development Report" (PDF). Department of Environment and Forests (Union Territory of Lakshadweep). Retrieved 3 August 2012. ^ "The Wild Life (Protection) Act, 1972". Department of Environment and Forests (Union Territory of Lakshadweep). Retrieved 5 August 2012. ^ "Lakshadweep Panchayats Regulations, 1994". lakshadweep.nic.in. Retrieved 1 August 2012. ^ "Administrative Setup". lakshadweep.nic.in. Retrieved 1 August 2012. ^ "Judicial Setup". lakshadweep.nic.in. Retrieved 1 August 2012. ^ "Our Parliament". parliamentofindia.nic.in. Retrieved 1 August 2012. ^ US Directorate of Intelligence. "Country Comparison: Population". Retrieved 1 October 2011. Marshall Islands 67,182 July 2011 est. ^ "Lakshadweep". borderdarshan.com. Archived from the original on 13 January 2013. Retrieved 1 August 2012. ^ "Kiltan Island". Lakshadweep.nic.in. Retrieved 25 February 2015. ^ "Commissioner Linguistic Minorities (originally from Indian Census, 2001)". Archived from the original on 8 October 2007. ^ Jha, Makhan (1997). The Muslim Tribes of Lakshadweep Islands: An Anthropological Appraisal of ... - Makhan Jha - Google Books. ISBN 9788175330320. Retrieved 2015-02-25. ^ "Report of the Working Group on Improvement of Banking Services in the Union Territory of Lakshadweep" (PDF). Rbidocs.rbi.org.in. Retrieved 25 February 2015. ^ "FISHERIES". lakshadweep.nic.in. Retrieved 1 August 2012. ^ "Department of Fisheries-About Us". lakshadweep.nic.in. Retrieved 1 August 2012. ^ "Tourism in Lakshadweep". Lakshadweeptourism.nic.in. 22 October 1988. Archived from the original on 19 February 2015. Retrieved 25 February 2015. ^ a b c "Symbols of Lakshadweep". knowindia.gov.in. Archived from the original on 12 November 2013. Retrieved 17 October 2013. ^ a b c "Lakshadweep Key Indicators" (PDF). Retrieved 17 October 2013. ^ a b "World's first ever low temperature thermal desalination plant opened at Kavaratti" (Press release). Ministry of Science and Technology (India). 23 May 2005. Retrieved 1 August 2012. ^ "One Million Litre Per Day (1 MLD) Barge Mounted Desalination Plant" (Press release). Ministry of Science and Technology (India). 18 April 2007. Retrieved 1 August 2012. ^ "Desalination: India opens world's first low temperature thermal desalination plant" (Press release). Press Information Bureau, Government of India. 23 May 2005. Archived from the original on 22 July 2012. Retrieved 3 August 2012. ^ "City institute plans to develop manned submersibles". The Hindu. 19 November 2009. Retrieved 1 August 2012. ^ "Kochi to Agatti Flights and their Schedule". Mapsofindia.com. 2014-09-08. Retrieved 2015-02-25. ^ "Means of Transport". Union Territory of Lakshadweep. Retrieved 1 August 2012. ^ "Entry Permits". Union Territory of Lakshadweep. Archived from the original on 24 February 2015. Retrieved 25 February 2015. ^ "Introduction to Lakshadweep Islands". The New York Times. Retrieved 1 August 2012. R. C. Majumdar (1979) The History of Ancient Lakshadweep, Calcutta.